The subject matter of Philip Schultz's latest collection of poems is one this magazine knows well—failure. At first glance, failure might seem like an odd choice for the accomplished writer and teacher, who has six books of poetry to his credit and is revered for founding the Writers Studio. However, a closer look at his earlier work reveals that Schultz has been writing about failure throughout his career. Naturally, with “Failure” (Harcourt) out in bookstores this month, we felt compelled to ask Schultz about his unique perspective on failure, and what inspired him to devote an entire book to our favorite subject. How long have you been dealing with the subject of failure? Knowingly? Just for this book. Two years ago I was having lunch with a friend and he told me his father was a failure. I told him about my past and it came out that there were some interesting similarities. My father died bankrupt when I was young—18—and it took over my life and my mother’s life. I think when you go through something like that there is always a sense that you’re the only one. I had never met anyone who had anything close to my experience. On the way back from that lunch I began wondering how many other men suffered the consequences of this and I felt inspired that my friend had been open with me. So I went home and wrote a poem called “The One Truth.” It came out rather—I won't say easily—but fluidly. It was dramatic and angry. After that I wrote a poem called “Failure” in which I dealt with the subject directly—head on. Looking back on my other work [the subject of] failure has always been there. It’s probably why I’m a writer—a poet. But I would deal with it in more isolated ways. This time it became the subject of a book. Why did you decide to title the book “Failure”? Very good friends and very good poets advised me not to. The arguments against it—and they were strong—were that I’d be pigeonholing it and that it would be a downer. I finally realized that in all honesty it was the subject of the book. And it was the only subject; everything else paled in comparison. [Plus], my wife thought it was a great title and I trust her judgment. Have you gotten any feedback from your audience about the title … or the book itself? I’m getting a response that’s different from any I’ve gotten before. There’s a rawness to it—a directness. The title poem came out three weeks ago in <i>Slate</i> and there was a discussion about it [on Slate's message board]. I didn’t look at it myself, for all kinds of reasons, but apparently it was very controversial and there were very strong opinions [on both sides]. Some of the discussion had to do with whether a son was calling his father a failure or whether the son was celebrating or defending his father. So apparently the poem hit a nerve. This went on for at least a week or so with people commenting and commenting on the comments. Is there a poem in the book that you struggled with more than any other? I've always worked hard on my poetry. And I worked particularly hard on this book. I didn’t fall on some of the devices I’ve used in the past. I wanted it to be crystal clear and direct. The long poem [“The Wandering Wingless”] was difficult. I can’t even guess how many drafts there were. But “Specimen” was really hard to finish. It came right after the title poem and “The One Truth.” I tell the story of seeing my father choke a man who stole cigarettes out of one of his vending machines. It's an image I’ve carried with me ever since I was a young boy. Speaking of your father, do people from different generations view failure differently? My father was literally pushed by his mother to succeed. It was, “Go out there and conquer.” He was driven, and he had four brothers and they were all driven. They all died very young (in their fifties) of heart attacks. So it was a generational thing where you had to climb up the ladder. My father pushed himself and pushed himself and failed continually throughout his life. Every business he ever started failed. [For his generation] failure was this great American taboo. It was the one thing you couldn’t do. It wasn't allowed. And yet all these people were doing it. What value can be derived from failure? Well, I think you appreciate that success isn't a finish line. In my life my family is everything. My father couldn’t enjoy what he had because it was always an aspect of a measuring stick that wasn’t anywhere near what he wanted. And I think that kind of philosophy—that American sense of measuring things—is that you never have enough. It’s all win or lose. In my own life, I wanted to be a novelist. For the longest time being a poet—even though I was good at it and successful at it—wasn’t what I thought I should be. But I couldn't be happier now. What is the difference between a “failure” and a “nobody”? [Laughs]. Well, according to the title poem failures are unforgettable. The speaker [in “Failure”] says that his father was incredibly successful at failure. He was a genius at failure. And it’s true. At my father’s funeral people were talking about all the businesses my father had failed at. I heard about things I never knew about. I was hearing about a man I didn’t know. In that way these people were proud of him and proud of their association with him. I mean—the ones who weren’t bitter that he still owed them money [laughs]. Can you be both a failure and a nobody? Yes…. You know there’s a wonderful Emily Dickinson poem about nobodies [“I'm nobody! Who are you?”]. Not all failures, I assume, are unforgettable. It's almost an existential question: Is anybody ever really a nobody? On some level is there any life so petty and so worthless that that person is a nobody? I like to argue against that. In the end, do you feel like you did justice to this material? I’ve never been happier with a book of poems. There isn’t a lot of metaphor or simile because of the clarity I wanted and because of the large story I’m telling. Whatever the world makes of it I think I am ahead of the game. In writing this book I not only wrote about my father. I looked at the part of myself that feels like a failure. I think it’s impossible to go through the experience without feeling like you are [a failure] too. In your mind, what would make this book a success? It’s a book of poems so the success is almost always going to be a modest one. But one writes poetry for the satisfaction, for the sense that maybe some of the poems will last. Maybe some of these will be about something that is of interest to others. Are you obsessed with failure? Or success? Well, I don’t think I'm obsessed with success [laughs]. I think this was a very personal quest—to face down something in myself and to make myself not afraid of it anymore. Whenever you are obsessed with something it owns you, and I think the idea of writing a poem is to own it. You can’t make a poem out of a subject that owns you, so I feel pretty good about it. Where do you go from here with your work? My next book, which I've handed in [“The Amount of Us”/Fall '09], will be selections from all my other books and some new poems. I’m now very involved with politics and history—what’s going on with this country in the world. One of the subjects in the [upcoming] book is the failure in Iraq. But the next book will be much less personal. The subject [of failure] was an obsession but I feel I worked it through to the other end. 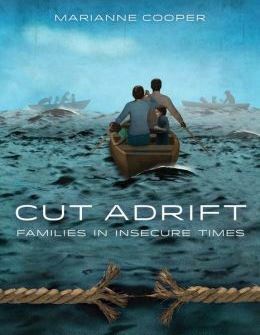 Cut Adrift—The emotional story behind our troubling economic statistics. The American Crossword Puzzle Tournament—Ellen Ripstein—the Susan Lucci of crosswords—finally wins the title.